Neemrana fort which is at a distance of 120 Km from national capital makes it perfect weekend getaways near Delhi. Neemrana is a small historic town in Alwar district of Rajasthan. Situated on a hillock the view from the fort is breathtaking. The small historical town is now emerging as one of the best tourist places near Delhi for a day or overnight stay. Quick facts-Purely for the history lovers, adventure seekers and holiday destinations near Delhi. Fort was build in the 15th Century and became the capital of the descendants of Prithviraj Raj Chauhan III (source Wikipedia). After India independence in 1947, Raja Rajinder Singh of Neemrana Fort moved down to Vijay Bagh. 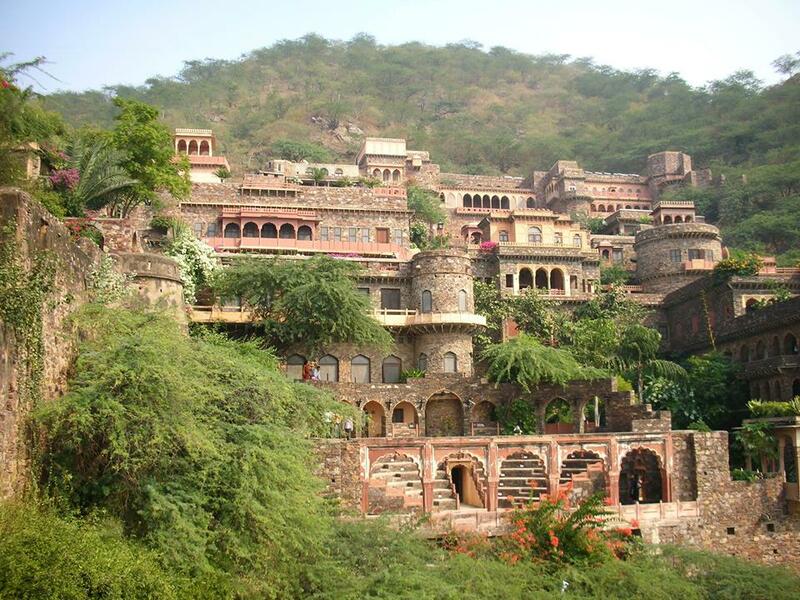 The ancient fort lately has been converted to a star hotel to Neemrana Fort Palace. The historical property transformed into a staying option will give you the high feeling of staying in the royal fort and much-needed quick weekend break which one looks to escape city life. If your aim is just looking for a weekend gateway or wants a pit stop at Neemrana with sightseeing of the fort, you could quickly choose the Neemrana fort day trip option for taking the tour of the fort. Prepare to shell out 500 Rs whereas, on weekends, the price goes up to 750 Rs. The timing on a weekday is from 9 am to 5 pm and on weekends is from 12 pm to 3 pm. Expect a crowd during long weekends. For a cheap and best stay with good reviews, I recommend Oyo Hotel Nano (rated 4.7/5) in Neemrana. Bring that excitement in you and enjoy the breath-taking Fort views as you fly down over a series of sharp steel zip lines, securely attached to a pulley – propelled solely by earth’s gravity. Trained and friendly instructors accompany you to ensure your maximum safety. The 1250 m zip tour takes about 2 hours. Zipline at Neemrana Fort operated by flying fox the leader in adventure sports in India with operating experience since 2007. 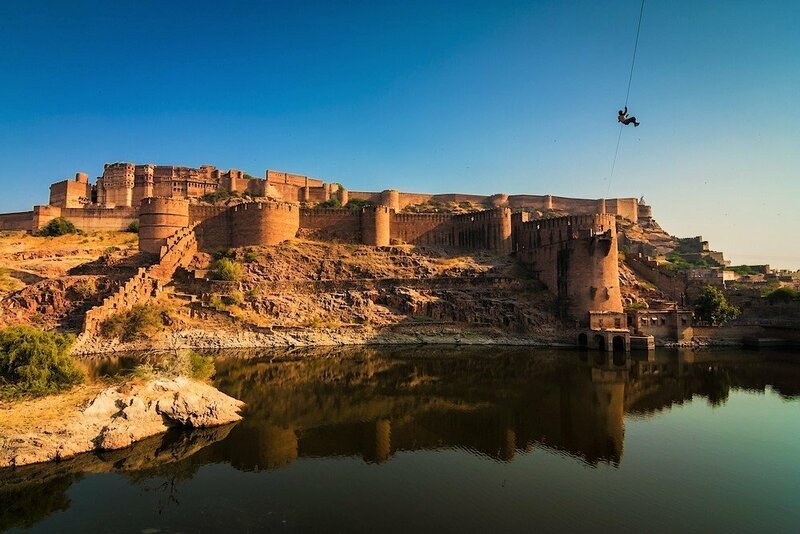 Check out the flying fox’s Neemrana zipline video.I bet you will be aspiring to do this. The Neemrana could be an excellent romantic gateway because of the solitude or could be a family vacation. If the theme of your overnight stay is to experience the unique royal feeling, spending time at the Neemrana Fort Palace should be your choice. You can book your royal room at Neemrana royal property directly from here . Recommended- Nation capital Delhi is called “Dilli walo ki”, why not explore these fun things to do in Delhi ? Wow! just watched your vdo! Flying Fox Neemrana, amazing adventure and so much fun + historical value. Its an amazing blog about Neemrana, I myself want to go there after reading this blog. After watching the video I am excited to visit this place. I really like it and I will discuss it with my friends too.